The classic arcade game Pac-Man has been available for the iPhone for a while now but Namco has released a new Pac-Man game called Pac-Man Remix. It costs $6, and it's not yet available from the App Store, though Namco's site lists it as "coming soon." An all new design and new game play elements make this different from the old Pac-Man. Pac-Man Remix is an all-new game based on the maze action game in which you move a spherical, chomping character down corridors to eat pellets while avoiding ghosts on the chase; you can turn the tables by eating power pellets which enable you to temporarily subdue the ghosts and score bonus points while you're eating them. 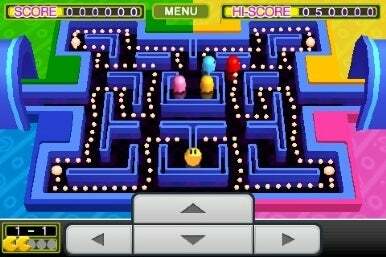 Pac-Man Remix features three selectable controller types, six boss characters, and six different stages each with five levels. New power-up items include the ability to jump over ghosts and walls, dash, a lucky item that turns all pellets into power pellets, and a ninja item that tricks ghosts into seeing an illusion of Pac-Man.